credit score 697 with a credit limit of 1000. Customer service is great when I have question about when the payment will be credit to my account they have the answer for me. the apr is little high but i don't a balance so no problem. I was really hesitate to apply after reading some of the reviews. I was pleasantly shocked when I was approved for $1000 starting credit line. I have been trying very hard to rebuild my credit the last 5 months. It has paid off. I have a rough and rouged road to travel but it will be well worth the effort. Lend up has applied my payment incorrectly twice and now I have sent in a payment to pay my account in full, check was cashed but not posted to my account, The reps and supervisor are "reviewing " my account to try and find the payment, that was cashed by them over 2 weeks ago. I do not suggest this card. Lenduo is what I would call a new Fintech company providing a service using modern technology and being more user friendly. I have been with them for while they have certainly educated me and helped me build my credit. I signed up to be on the waitlist for the card and I have very happy it so far. I started off with a $300 credit limit. After 6 months, they increased it by $300 to $600. I have a couple of other cards who have not increased my limits at all. Lendup has been good to me and they always treat their customers well. If you just pay on time, they will increase your credit limit. Before I got this card, I have taken a few loans from them and they have also taught me to improve my credit score. I have used Lendup for loans and have actually moved up their "ladder". The terms when I got this was as follows: $60 AF, 29.9% APR, credit limit of $300. After 6 months, they doubled my limit tp $600. After a year, I had a $1000 limit. 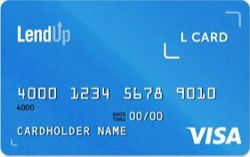 Lendup has always been great and in fact, they have helped me rebuild my credit and I just got approved for a couple of mainstream no annual fee Visas. This is a great card. In fact, it was my second card I got to rebuild my credit. They started me off with $500 limit. After 8 months, they doubled it to $1000. They are a great card for rebuilders. This is my second rebuilder card. I like it because it is transparent, simple and has no outrageous fees like other cards that I have researched. Annual fee is $60 and yes, the interest is high (29.9%). But I pay in full every month so that does not bother me. Paying bills online is pretty simple as well and if you pay on time, you will get a credit line increase. I had my double to $600 after 6 months. The card also reports to the bureaus so you will definitely build up your credit scores. Was discharged from my BK and six months later, I got this card. They gave me a $300 limit. After six months, they doubled it to $600. They do report to the bureaus and it is a great card for rebuilding. Within six months, my score had gone up by 70 points. I love lendup and this card. They have provided good education about loans and credit. They did however put my first few payments on hold. But at the same time, they did increase my limits after 7 months. I cannot believe they put my payment on hold for 5 days. I tried calling their customer service but realized they closed at 5pm and I had to call the next day. Am cancelling my card. The thing I really like about Lendup is that they will increase your credit limit if you pay on time. After the first six months of paying in full and on time, they doubled my credit limit. In contrast, the Milestone card I had has not increased my limit even after one year. Lendup is a fantastic company and I've only had great experiences with them since I decided to try them out. When they announced that they were going to have a credit card, I signed up for their notification. I applied and was approved for $300. It wasn't much, but after 6 months of timely payments, I was given a CLI of $300 and now have $600 in total credit limits. I signed up to be put on the waiting list. I applied and was approved for $300. Haven't had this card for long but given my experience with Lendup, this should be a good card. I have had very good experiences with Lendup Loans. I worked up their ladder to a "prime" level. When they started offering this card, I signed up to be on the list. When I got offered, I applied and was approved for $300. AF was $60 with 29.9% apr. I am happy with the card so far. Lendup is great. I signed up to be on the waitlist and applied. My starting limit was $300, annual fee was $60 and apr was 29.9%. I pay in full every month so the rate does not bother me. After six months of paying on time, Lendup increased my credit limit and it is no $1000. Love Lendup. Love this card. Very simple and straight forward. I researched cards for bad credit folks like me and fees were just outrageous. Just pay your bills on time and your score will slowly but surely go up. Lendup actually teaches you how to improve your financial situation and rebuild your score. When I found out they were offering a card, I signed up to be on the waiting list. Once I got the card ($300 limit and $60 AF), I made sure I made it off every month on time. Within 6 months, they doubled my credit limit. I started off by getting a loan from Lendup. Then I gradually made my way up their "ladder". I even took their financial education course. I made it to prime (which I think was 10,000 points) and I got offered bigger installment loans and the L Card. I think you could only be offered this card is you made it up their ladder. My initial credit line was $300, which is what most folks are getting. I got approved this card recently even though I had no loan history with them because they do not lend in my state. I had signed up for their "alerts" and got the invite. I was approved for $300. Years ago, my credit got hit because of some bad decisions that I had made. In my rebuilding efforts, I actually got loans from Lendup. They give you points to climb up their "ladder". The more points you got, the more they would lend you and at lower rates. I guess I finally made it high enough that they offered this card to me. I applied and was approved. Annual fee was $60, limit was $1000 and the rate was 29.9% if you decide to carry a balance. Lendup is a great company to work with. I got this card even though my scores were low and I had been rejected by other cards. The annual fee is $60 and my limit was $300. I made sure I paid in time and in full and within about 7 months, I got a credit line increase of $300, doubling my limit to $600.